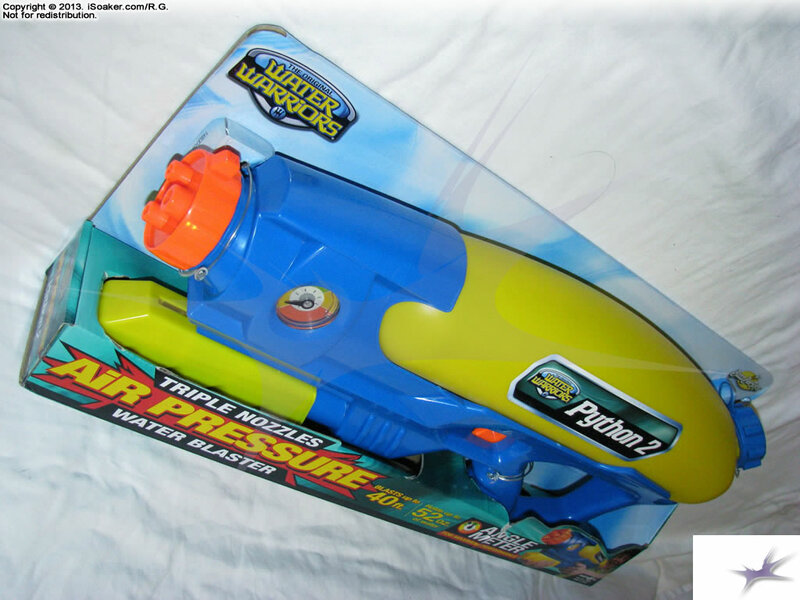 The Water Warriors Python 2 is a great pressurized reservoir water blaster released by Buzz Bee Toys Inc. in 2013. As a newer version of the Water Warriors Python (2012), the Python 2 more-or-less improved on every aspect of the Python from output to range to capacity to ergonomics. As such, the Water Warriors Python 2 was declared the Best New Water Gun / Water Blaster for Summer, 2013 by iSoaker.com. Read on to learn more about this simple, solid performance pressurized water blaster. The Water Warriors Python 2, as noted above, is an evolved version of the original Water Warriors Python (2012). The newer Python 2 is a little chunkier than its predecessor, though still sharing the same colour scheme, same three-option nozzle selector settings, and both using pressurized reservoir technology. Granted, unless one is familiar with the original Water Warriors Python, these similarities are not specifically noted on the box. 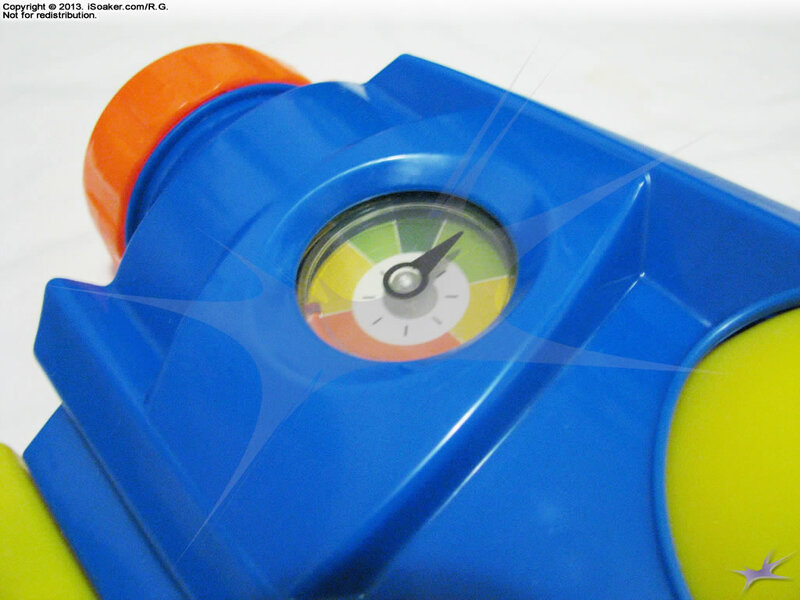 What can be seen is a fairly centered position for the trigger as well as a gauge on the side which, as the box notes, is an angle meter, not a pressure meter as appeared on some earlier Super Soaker and Water Warriors products. While the nozzle selector, trigger, reservoir, and reservoir cap are all readily visible, the pump grip is somewhat obscured as is the lower half of the trigger-grip area. 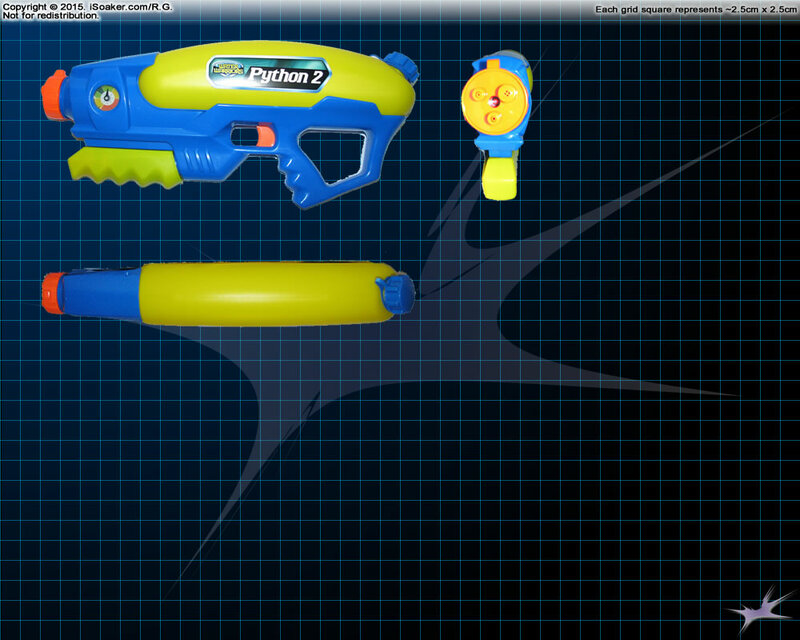 The box is quite different from that of the original Water Warriors Python that showcased nearly all but the bottom most part of the trigger-grip area at first sight. Behold, the Water Warriors Python 2 in its full glory! Free from the confines of its packaging, the Python 2’s pump grip and sculpted trigger-grip region are fully visible. The trigger-grip’s back extension provides both structural stability as well as added functionality as a good place to hold the blaster when refilling. Picking it up, the beauty of the Python 2’s design can be immediately felt in its near perfect balance both when empty as well as when filled. Doing a side-by-side comparison between the Python and Python 2, one can see the similarities and striking differences more readily. The Python appears slimmer while the Python 2 has more apparent bulk. The Python’s trigger-grip area is also much farther back on the water blaster while the Python 2’s reservoir looks a little larger. Thanks to its nearly centered placement of the trigger-grip region (mostly centered on the reservoir) combined with its semi-broad, smooth underside of the reservoir, the Python 2 fits nearly perfectly in one’s hand. The open nature of the trigger-grip allows even those with larger hands to not be cramped by its design. 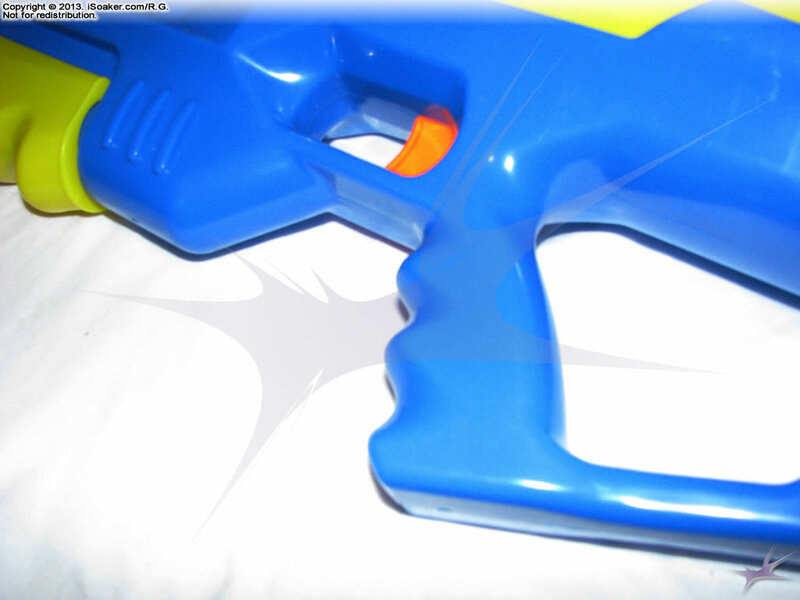 The trigger, itself, pulls smoothly, yet with enough resistance as to not be activated by accident. Perhaps the only way to improve the grip area any more would be to add some light texturing, but there’s truly no issue when it comes to holding this water blaster. The Python 2’s pressurized reservoir system powers its selected nozzle. Like the Water Warriors Equalizer, a properly filled Python 2 (approximately filled roughly 2/3 to 3/4 full) can be pumped and pressurized enough to completely empty the reservoir without needing to pump in more air while achieving greater than 80% power throughout. Of course, pumping in more air in-between shots if always recommendable when possible, but it is nice to know that re-pumping is not an absolute necessity. The Python 2’s two stream settings and one burst setting all provide different, yet useful functionality. The largest stream offers good drenching power and full range. The burst setting offers increased drenching power and full range, but may be more easily affected by cross-breezes. The smallest nozzle setting still offers good power while definitely letting one conserve water a little more when one’s reservoir is running low. 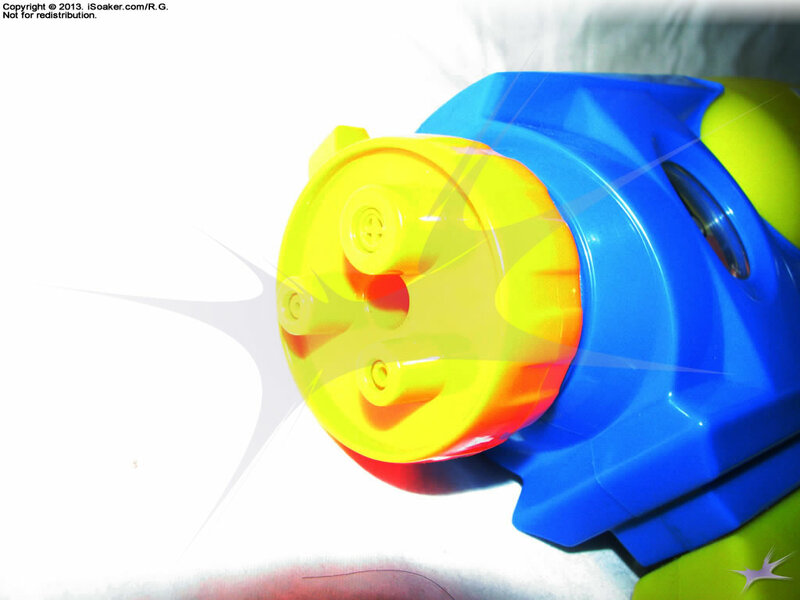 The nozzle selector, itself, has a small tab on one side that helps one turn the selector as well as providing a visual clue regarding what nozzle is selected without needing to look at the front of the blaster. Of course, being a pressurized reservoir water blaster that can empty its full reservoir on a single charge, shot times are excellent on any setting. The Water Warriors Python 2 is basically as good, if not better than the Water Warriors Python (2012), on all its nozzle stats. Of course, while streams are important, how long it takes to get up to pressure is vital as well. Thankfully, the Python 2’s forward-mounted semi-tracked air pump is comfortable to use and does a great job at pressurizing a properly filled reservoir quite quickly. While the reservoir should be pressurized with 30-40 full pumps, this can be achieved easily in less than 30 seconds for the focused warrior. The semi-tracked nature of this pump prevents it from rotating and makes it feel quite sturdy and stable, even when fully extended. The full pump length does feel to be on the shorter side, though. 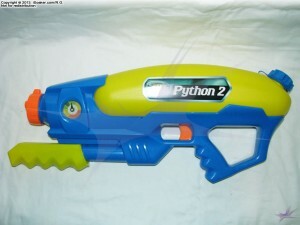 Of course, for the Python 2 to be pressurized and primed for battle, its reservoir must be filled, then sealed securely. 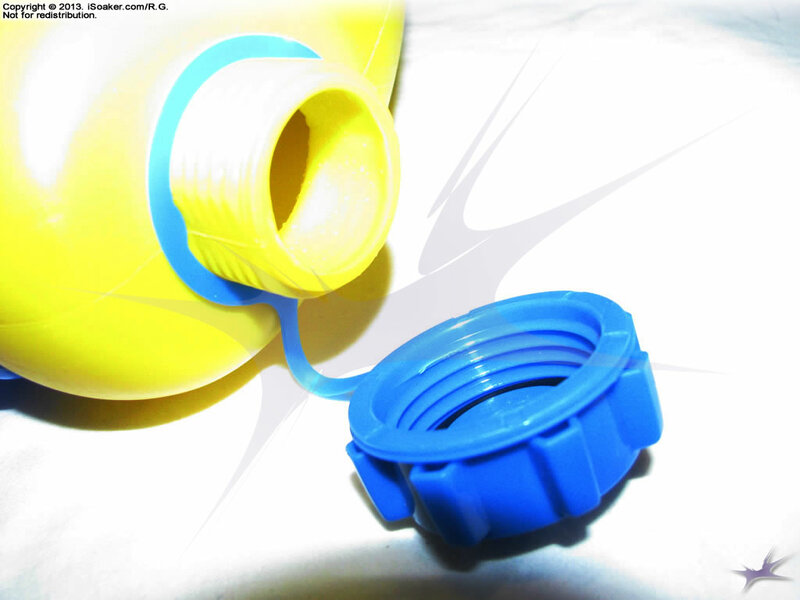 The Python 2’s reservoir cap does a good job of providing a standard-sized opening into which water can be added to the reservoir and has a rubber O-ring to provide a good, air-tight seal when tightened. The Python 2’s reservoir is slightly larger than the older Water Warrior Python’s reservoir, providing one a little more drenching potential and longer field life. 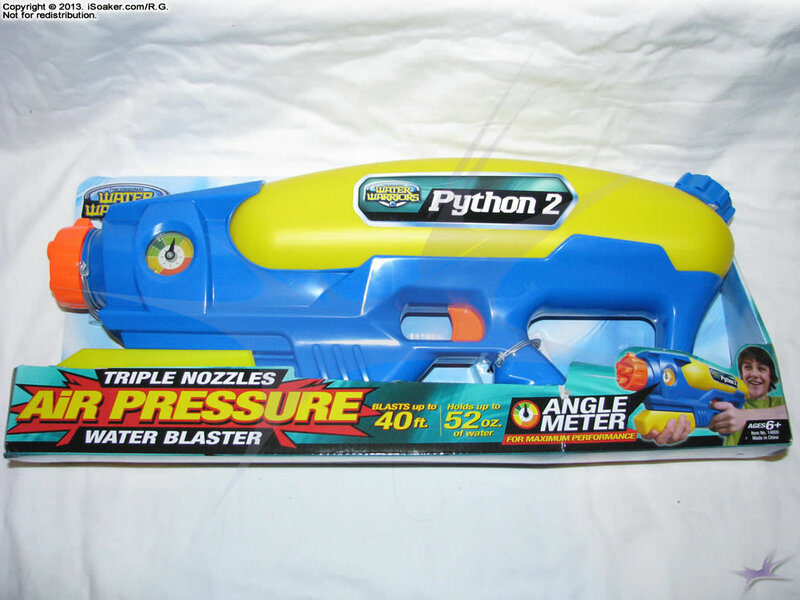 Beyond this, the Python 2 has one added feature: an angle meter. While simple a weighted level indicator with a coloured background, the arrow points upwards and indicates whether the Python 2 is at an optimal firing angle. While water warfare veterans may not need this feature during battle, the angle meter is good when training those less familiar with pressurized water blasters. Most already know that angling a stream upwards when firing will increase range, but many overlook the fact that most air-pressure water blasters do NOT fire downwards well nor are able to fire upside-down. Few remember that the placement of the intake tube towards the back of the reservoir also means that downward angles tend to put the intake tube’s opening above the subsequent waterline. Granted, during battle, one rarely has the time to check whether one is at an optimal firing angle, but for training, this device can prove useful. Of course, while all of the above is important, the true value of a water blaster is how well it performs in a water fight. The Water Warriors Python 2 not only feels good to hold, but its power and balance make is great to use in battle. 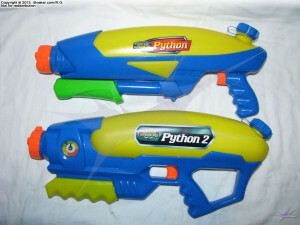 Ambitious Users may even opt to try dual-wielding two Python 2s so long as they remember to properly fill and fully pressurize their blasters before heading out from safety. The Python 2’s nearly 3x burst setting and 2x large stream setting will keep up with all but the larger elastic-chamber-based water blasters. 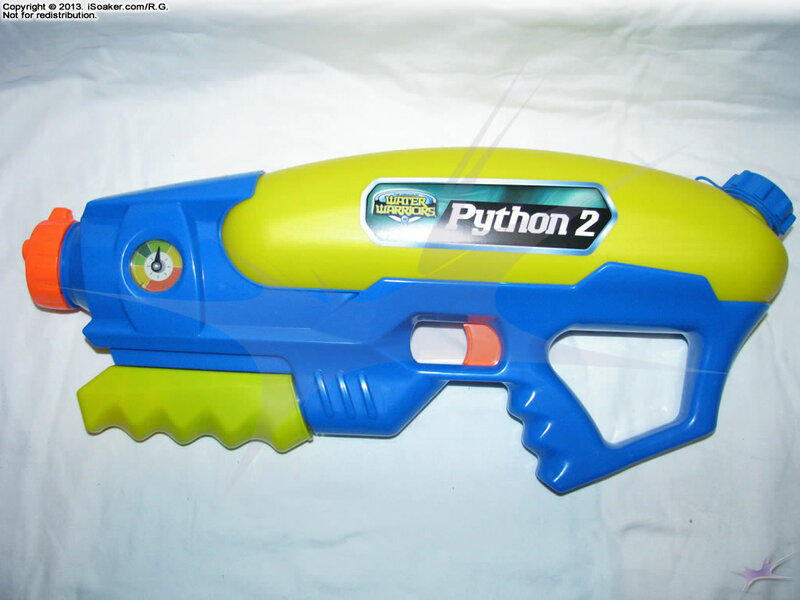 The Water Warriors Python 2 is a great, light, perfectly balanced pressurized-reservoir-based water blaster. 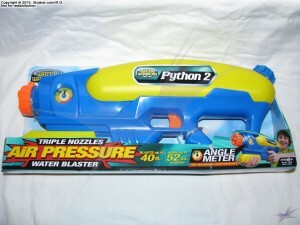 With three useful nozzle settings to choose from, an angle gauge for training purposes, and a reservoir that, when properly filled, can be completely emptied on a single charge (though pumping in-between blasts does provide overall better performance), the Water Warriors Python 2 makes a great addition to almost any armoury. While outclassed by larger, elastic-based water guns, the Water Warriors Python 2 can keep up with most air pressure-based water blasters and even keep those using the larger rubber bladder-based blasters wary and not simply think they can attack with impunity.